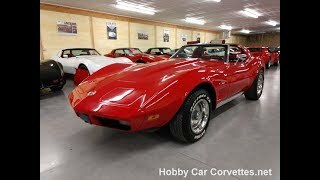 Hi, I am interested in your 1974 Chevrolet Corvette listed on Autotrader for $22,000. I'd like to get more information about this vehicle and confirm its availability. Numbers matching, L48/350 motor, 4 speed manual transmission, 69,000 miles on dash, red interior, manual transmission, rally wheels, AM/FM/MP3, headers, dual exhaust, tinted glass, original air cleaner assembly, original valve covers, original ignition shielding, original seats & door panels, and much more. This corvette has only had two owners. It has been garage-kept and well-maintained all its life. The previous owner had new fiberglass bumpers, left rear trailing arm, spring, and sway bar links installed. We changed the oil and filter, transmission grease, changed the rear end grease and additive, and checked and lubed the chassis. We also replaced the front brake calipers, front rubber brake hoses, front brake pads, 8 spark plugs, body weatherstrips, complete carpet, rear tray kit, AM/FM/MP3 player, rebuilt the carburetor, and much more. We also had the corvette repainted in base-coat/clear-coat. This vette seems to run and drive very nicely! This corvette is very rare seeing as it does not have power steering or power brakes. GM only built 1,558 without power steering, 4,196 without power brakes and only 12,356 with the 4 speed transmission out of 37,502 total production in 1974.